This is a nice restaurant with good food. 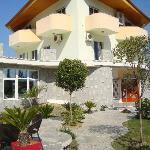 It is located some km outside Tirana in the direction of Elbasan. You can find there nice Tris of pasta, very good appetizers, well prepared meat and delicious desserts. But need to improve the interior design, that is why I prefer to go there in spring and summer. Elmondi the owner and head chef, trained and worked in top London restaurants before opening back in his home town. His passion for food is evident and he'll gladly explain anything and in perfect english. You must try his starter of 3 pastas served in unique plates. Let him prepare you a surprise meal using the best quality local produce whenever possible. Mondi heads to the market every morning and only buys the best. The restaurant has a fabulous garden dining area for when the weather is warm and you can hear the nearby river rushing along. The puddings are a delight. We had a delicious hot apple and cinnamom pastry served with a pyramid of homemade creamy cherry ice cream and also a chocolate sponge soaked in rum, topped with pannacota and finished with wild berries....it looked nearly too good to eat!!!!! It's a short taxi ride from the city and open 7 days a week. By the way, the property has it's own vineyard and they produce their own wine, how wonderful is that. I visited twice during my stay and will definately head straight back there on my next visit...say hello to Mondi from me when you go. Been to Alpin? Share your experiences!